In 2013, the Network was increased by the presence of World Bank and some other participants, which caused the need for more connectivity between participants and faster spreading of actions, results and call to action that are inherent to the project. Thereto, a new website was conceived, based on Linked and open data concepts. Comprehending that Semantic Web is the right approach to talk and research about Open and Linked Data, the decision of build on top of the content of the OD4D website a suite of softwares to connect and use the potencial of semantic data was taken by the team of W3C Brazil office, and counts on the funding of Brazilian Network Information Center (NIC.br) on behalf of the Brazilian Internet Steering Committee (CGI.br). The goal of building this new platform is to strengthen and expand the existing community, meet new cases, point to good practices in data on the Web, promote relevant standards and vocabularies, as well as emphasizing the value of content in multiple languages ​​within the platform. Besides being a space for knowledge exchange, the platform also aims at being itself an example of implementation of semantic web and linked data technologies.The platform can acts as a prove of concept to investors, governments, institutions and individuals that have intention to work together in creating a collaborative network around the theme of publishing data for development in Latin America, Africa, Asia and the Caribbean. The system consists of 4 modules: the publisher, which is the CMS , storage for static content generated thru the CMS , the parser  and the semantic store . As you can see in the picture, the publisher module enables the input of new content into the website and keeps it in a PostgreSQL data store. The parser processes partners' RSS channel and extracts semantic triples about this content. Finally, the storer stores RDF triples using the Turtle syntax with the help of Jena suite and provide an endpoint so that users can access this information from the collected triple repository. 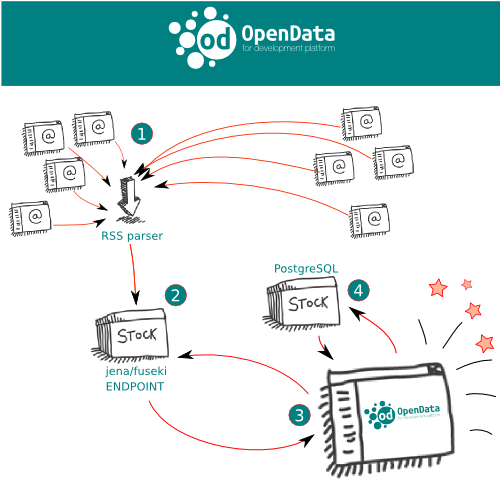 The OD4D project is composed of 5 repositories. od4d-dev-envContains everything needed to start contributing to the OD4D project.